Its a pleasant sunny day with light WNW winds. We are still under the control of the NE Pacific ridge and as a consequence, we are stuck with miserably nice weather. This flow pattern took some of the bite out of the sea-breeze. The timeseries of our nearby anemometer shows the calm conditions, but with a shift to offshore flow during the overnight hours (i.e. 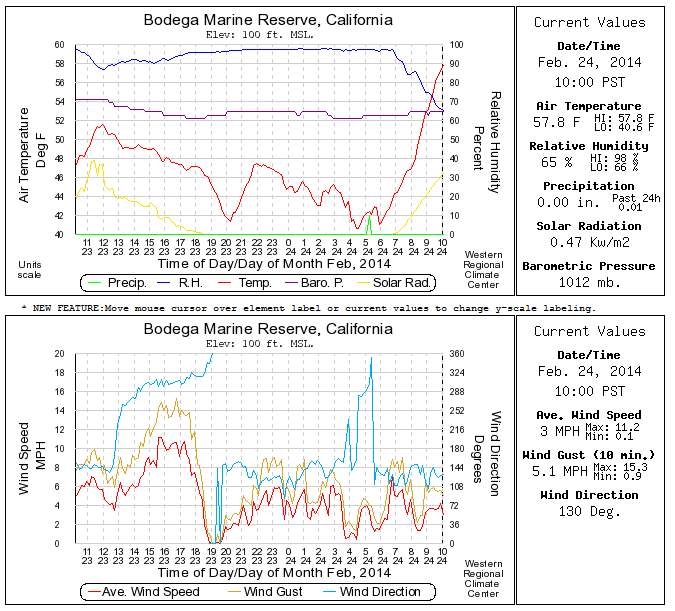 during the sea-breeze reversal). 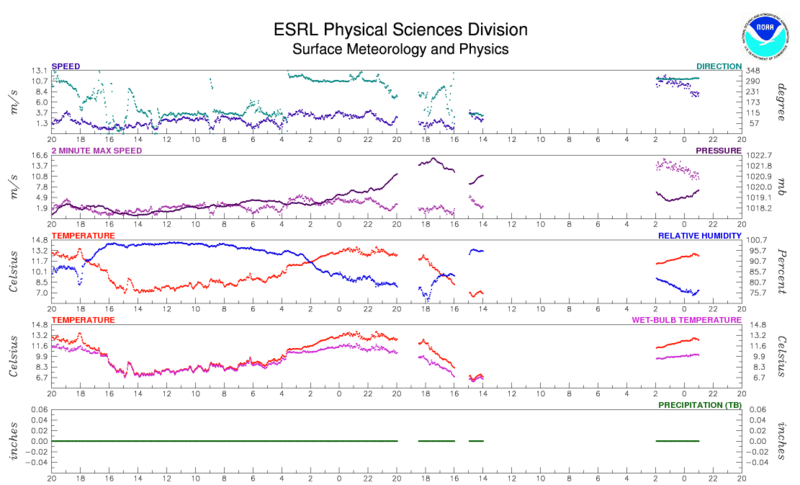 48 hour timeseries of surface weather variables at BBY. Credit: NOAA-HMT. There isnt much else to report in local weather news. 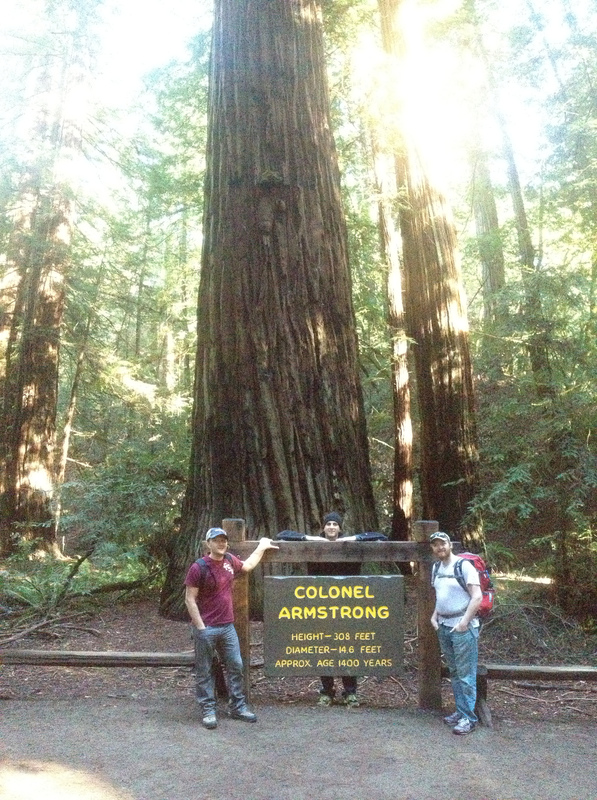 We are still anticipating a storm reaching the Northern California coast next Friday and Saturday. Ill update the forecast of that storm tomorrow. Yesterday we were excited by the possibility that a small plume of enhanced dust concentration may cross our area. According to global circulation model (GCM) / chemical transport model (CTM) forecasts This plume originated in Asia several days ago, was cut off from it’s parent plume by a mid-Pacific storm, and then would have been steered clockwise around the ridge to our location. We were hoping to draw some of this dust through our sampling manifold, cause it to participate in heterogeneous immersion ice nucleation in our CFDC and then investigate the ice crystal residue chemistry through a combination of a pumped counterflow virtual impactor and an aerosol time-of-flight mass spectrometer. The impetus for believing the dust would reach us came from a forecast made by the NASA global modeling and assimilation office (GMAO) GEOS-5. 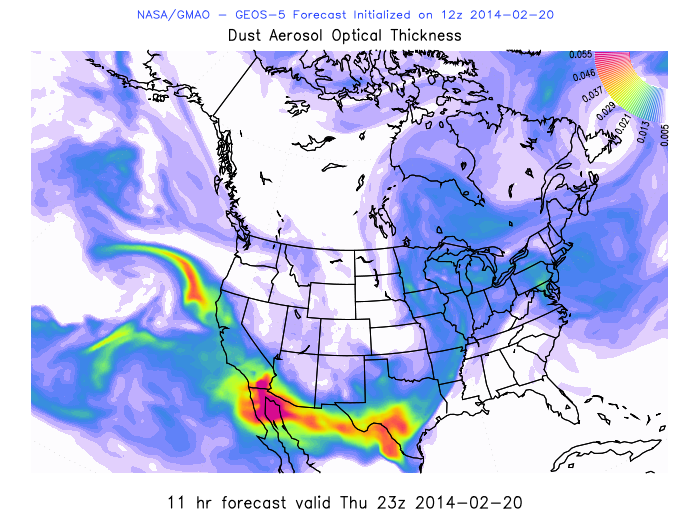 Tropospheric dust AOT forecast valid at 3 pm PST on Feb 20, 2014. Credit: NASA GMAO. The GEOS-5 is a global circulation model which contains some simplified aspects of a chemical transport model. Dust mass mixing ratio is forecast based on emission from a saltation-imapction type emission model and the GEOS-5 3 dimensional winds. The model shortwave emission model is used to calculate the aerosol optical thickness (AOT) which would result from the dust mass and vertical distribution in each atmospheric column. Unfortunately, we did not detect elevated dust levels at the surface yesterday afternoon in BBY, meaning that the point forecast for our area of the GEOS-5 domain may have busted. The caveat here is that we are only privy to the total column dust AOT through the web portal. It could be that dust in this plume simply never reached the surface. Let’s examine further cross-pacific dust transport and how we might verify global model (such as GEOS-5) forecasts. North Pacific swaths of MODIS level 2 AOT from Feb 18, 2014. Credit NASA-GSFC. 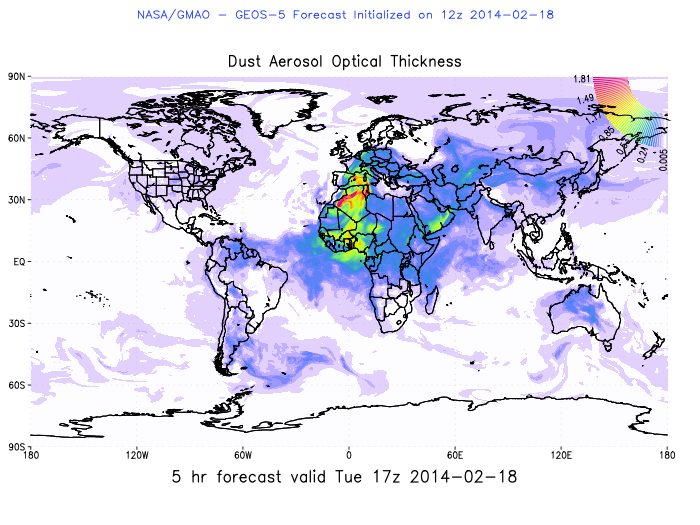 Tropospheric dust AOT forecast valid at 17 UTC on Feb 18, 2014. Credit: NASA GMAO. The model does predict a plume of moderately optically thick dust extending east from Asia over Japan at the correct date and time. For now, we will not worry about whether the model gets the magnitude of AOT correct, but rather simply worry about a “qualitative plume” arriving at the correct location in space and time. We should note that the meridional extent of the plume in GEOS-5 is smaller than it appears in MODIS AOT. 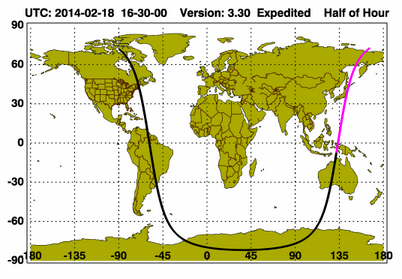 One orbital path of the CALIPSO satellite on Feb 18, 2014. Credit: NASA-LARC. 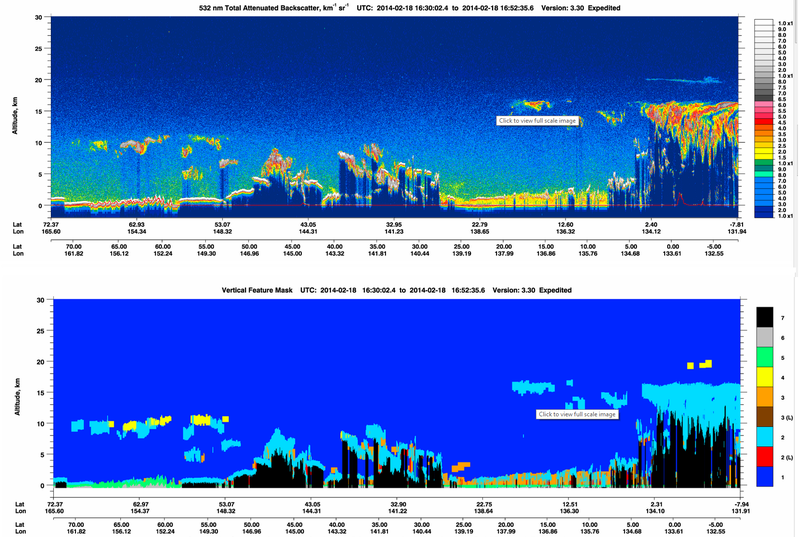 532 nm attenuated backscatter (top) and target classification (bottom) from CALIOP along a path which crossed the northeast Pacific on Feb 18, 2014. 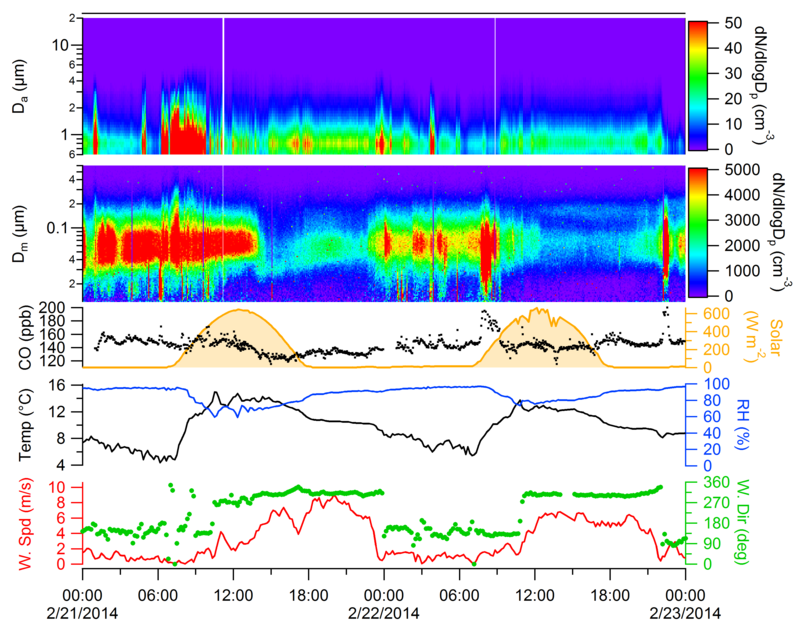 The top plot is the time-altitude cross section of 532 nm attenuated backscatter. The plume we are interested can be seen between 134.5 and 139 E longitude as a shallow near-surface layer of yellow shading. The bottom plot is generated based on backscatter and the 532 nm depolarization ratio. After data is collected, regions of significant backscatter signals are classified based on their likely size and shape relative to Mie spheres. According to the classification algorithm, this near-surface layer is full of aerosol. So far, so good. We identified a layer of aerosol in MODIS data, its timing and position was forecast by GEOS-5, we saw an aerosol layer with CALIOP, and are now confident that this aerosol layer is confined to the lowest 3 km. North Pacific swaths of MODIS level 2 AOT from Feb 20, 2014. Credit NASA-GSFC. MODIS identified very low AOT in the cloud-free pixels near the north-central California coast during its overpass on Feb 20, 2014. This area was crossed by MODIS near 2230 UTC. It is near the same area forecast by GEOS-5 to contain elevated dust aerosol optical depth at 2300 UTC (see third figure, this post). do not agree on the timing and location of an aerosol (possibly dust) plume. Our instruments also did not encounter dust spectra at a rate above background level, so it may be that the GEOS-5 forecast lead us on a goose chase yesterday. Going forward, we will continue to use global model dust forecasts to guide our measurement strategies, but they must be taken with a large remote-sensing grain of salt. Tomorrow’s post: Medium range convergence of global model forecasts.